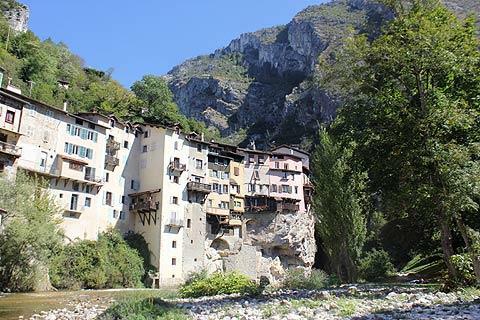 The small town of Pont-en-Royans is on the Bourne river situated between Grenoble (to the north-east) and Valence (to the south-west), in the southern part of the Isere department, in the Rhone-Alps region of south-east France. It is at the edge of the Vercors Natural Regional Parc. 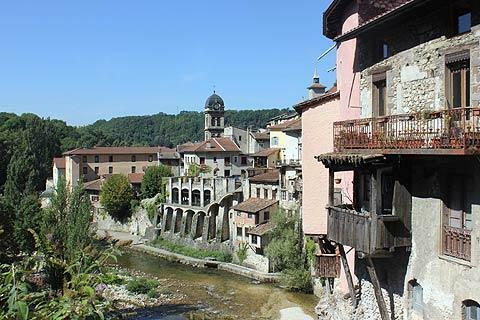 France This Way comment: there is not a great deal to see in Pont-en-Royans except the area with the suspended houses and the river, but this area is very pretty so a visit is recommended when you are pasing - ideally at lunch time so you can enjoy a picnic next to the river! 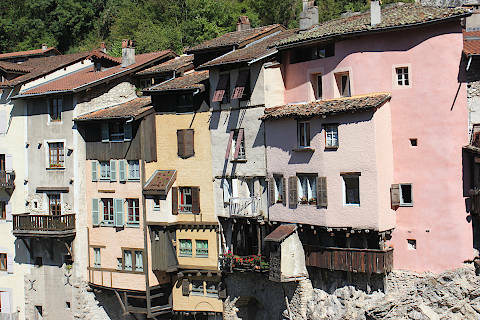 The highlight in Pont-en-Royans is the group of 'suspended' 16th century medieval houses that line the cliffs along the river, many painted in attractive pastel colours, some with balconies over the 'abyss', and all very scenic. The best view along the river and houses is from looking down along the river from the little stone bridge at the top of Pont-en-Royans, with another excellent view from the other side of the Bourne river. Below the houses there is access to the river for children to paddle and a lovely river-side picnic area with tables. The water is very cold so ideal for a paddle on a hot day but a bit too cold in spring or autumn. The importance of water to the town is such that they have opened an unusual 'Museum of Water' which not only explains about water cycles, pollution etc but also has a 'water bar' where you can choose from more than 1000 bottled waters from around the world and still drive home safely afterwards! Scenic highlights in the region are numerous with the cirque and caves at Charanche and the Gournier waterfall being among the most visited. You can also visit the scenic villages at Auberives-en-Royans and Saint-André-en-Royans, among others in the vicinity. There is a very scenic route between Pont-en-Royans and Villard-de-Lans through the gorges de la Bourne, closed when we visited but said to be exceptionally attractive as it follows along the gorges of the Bourne river, and also apparently requiring great care and attention to your driving. 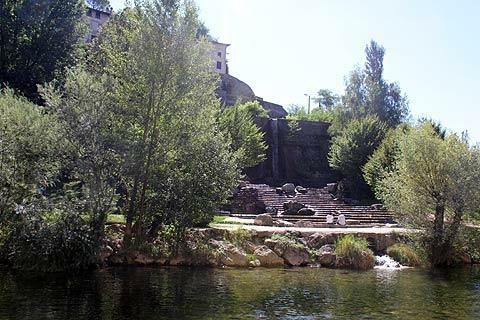 Close by in Beavoir-en-Royans is the Convent des Carmes and its garden - the Jardin des Carmes. Laid out in the style of a medieval garden it has three main areas: Le Jardin des simples planted with herbs and aromatic plants; Le Jardin Potager planted with ancient varieties of vegetables and the Verger with a large number of different apple, pear, cherry and plum trees. 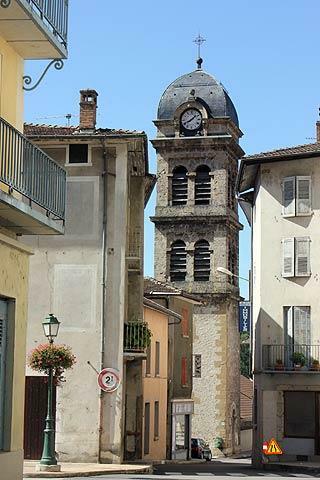 Pont-en-Royans is also a gateway town for the Vercors Natural Parc, with its many scenic highlights.